Day, to Industry Research sponsorships that offer exposure at both the Summit and a post-Summit press conference in New York City. As a sponsor, you will be honored on stage at the Summit, plus receive year round exposure on our website, in press releases, on the GWS mobile app, on the printed invitation and more. 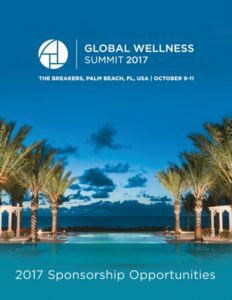 For information on 2017 Global Wellness Summit sponsorship and on-site branding opportunities, please email Michelle Gamble, or view our sponsorship brochure. We would like to thank our early sponsors below, whose valuable support of the Summit makes such an event possible. The Breakers is a timeless resort paradise celebrated for its gracious staff and unforgettable seaside glamour. Situated on 140 acres in the heart of Palm Beach, Florida, the hotel features 538 guest rooms and suites, including the private-access Flagler Club — an ultra-luxury boutique hotel situated atop the resort. Guests can bask in a renowned oceanfront experience complete with a private beach, four refreshing pools, poolside bungalows, and a mix of watersports. Multifaceted amenities include nine distinctive restaurants, 36 holes of championship golf, Har-Tru tennis courts; an exquisite indoor-outdoor spa and oceanfront fitness center, a Family Entertainment Center, and 11 on-site boutiques. The Breakers also features 70,000-square feet of meeting and event space, perfect for any occasion. Distinguished as a AAA Five Diamond property, the resort has earned numerous accolades for its commitment to the environment, community service and the quality of life it provides to its employees. Visit The Breakers at www.thebreakers.com. Canyon Ranch® has been a pioneer and an industry-leading proponent of the wellness lifestyle for nearly 40 years, operating the world’s most celebrated collection of life-enhancement properties. Canyon Ranch has wellness destination resorts in Tucson, Ariz., and Lenox, Mass., as well as the Canyon Rach SpaClub® at The Venetian® & The Palazzo® hotels in Las Vegas, Nevada. Canyon Ranch SpaClub at Sea® is found onboard twenty cruise ships comprised of Cunard’s Queen Mary 2® luxury ocean liner, Oceania®, Regent Seven Seas Cruises®, and Celebrity Cruises®. Visit Canyon Ranch at www.canyonranch.com. LifeNome is a DNA-based Wellness AI company headquartered in New York City. Founded by Dr. Raya Khanin (Weizman Ph.D and a top 20 cited scholar in computational genomics) and Dr. Ali Mostashari (MIT Ph.D. and top 20 cited scholar in complexity science), LifeNome envisions to a world where wellness is science and data-driven, and personalized to an individual’s unique biological, personal, and behavioral characteristics. LifeNome’s wellness reports are currently offered in 12 countries in North America, Asia, Europe and Central and South America. In 2016, UBS recognized LifeNome as a top player in the genomics 2.0 market. Visit LifeNome at www.lifenome.com. The [ comfort zone ] brand was conceived and launched in 1996 as the skincare division of the Davines Group, which was founded in Parma, Italy, in 1983 by the Bollati family. What began as a research laboratory for the development of high-quality, highly effective products has grown into an internationally successful professional spa brand with a diverse range of product and treatment offerings. [ comfort zone ] represents a complete system of care for the skin, body, and soul. Our exclusive collection of products, treatments, and rituals has been created with an unwavering commitment to finding the most powerful ingredients and delivering the most effective results. We believe in working from the inside out and from the outside in to improve the human condition and treat the whole body. We seek to promote a holistic, healthy and sustainable lifestyle, based in science and strengthened by passion. Visit [comfort zone] at www.comfortzone.it. jane iredale – THE SKIN CARE MAKEUP, is a comprehensive line of makeup developed with quality minerals and skin care ingredients that are good for your skin and create a healthy, radiant glow. All of the jane iredale products adhere to the highest standard of integrity as each product is subjected to rigorous sensitivity and safety tests to ensure it is as good for the skin as it is beautiful to wear. It is a top makeup choice of skin care professionals and is recommended by plastic surgeons and dermatologists worldwide. Visit jane iredale at www.janeiredale.com. Longeva is a wellness lifestyle company focused in results-driven sleep wellness programs for spas, resorts and wellness retreats. In 2016 the company launched “Project Z, Sleep Wellness Initiative”, a comprehensive program based on the company’s belief that Spas can shift the global sleep paradigm – once they master the ability to go from provider to teacher. The company’s innovative program integrates sleep wellness consciousness and time-tested practices into multiple guest touch points that span Fitness, Food and Beverage, the guest room, ’sleep fitness’ classes, inspiring sleep skills massage and take-home sleep skills kits. Visit Longeva at www.longeva.com. Situated in the warm shade of the Santa Catalina Mountains in northern Tucson, AZ, on 400 acres of idyllic land, Miraval is a top-rated all-inclusive destination resort and spa dedicated to helping guests live life in the moment. Since 1995 the property has been consistently ranked as one of the world’s top destination spas by Travel + Leisure, SpaFinder and Condé Nast Traveler. Offering an array of dynamic growth and development programs, one-of-a-kind, luxurious spa treatments, authentic, flavorful and healthful cuisine as well as an expert staff of renowned wellbeing specialists, Miraval helps to open eyes, minds and hearts. In 2012, the resort unveiled the Miraval Life in Balance Spa with Clarins, a state-of-the-art oasis designed to transform guests both physically and emotionally. Visit Miraval at www.miravalresorts.com. 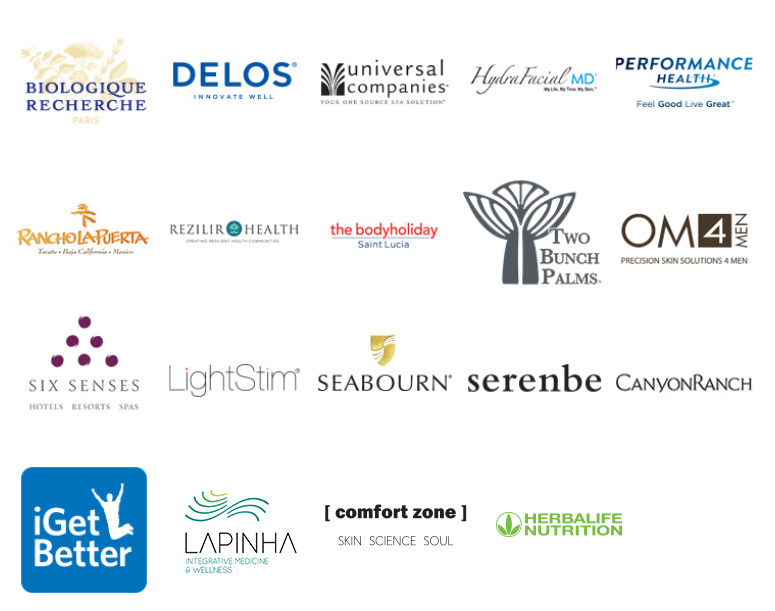 For more than 30 years, over 30,000 spa professionals in 47 countries have trusted Universal Companies to be their single-source supplier, providing thousands of products to help them manage and grow their businesses. Located in beautiful and historic Abingdon, Virginia, we distribute furniture, fixtures, equipment, implements, supplies, and spa apparel to customers from the largest spa to the independent practitioner. Universal Companies also offers professional skin and body products, retail items, and merchandising tools, and provides spas with innovative consulting services, educational materials, and training options. For more information about our company, please call 800-558-5571 or visit www.universalcompanies.com. Weight Watchers International is an international company, based in the United States, that offers various products and services to assist weight loss. In the early ’60s, Weight Watchers founder Jean Nidetch began inviting friends into her Queens, NY home once a week to talk about how best to lose weight. Today, that group of friends has grown to millions of women and men around the world who’ve joined Weight Watchers to lose weight and lead healthier lives. The core philosophy behind Weight Watchers is to use a science-driven approach to help people lose weight by eating better, moving more and providing support. Visit Weight Watchers International at www.weightwatchers.com. Amrit Ocean Resort & Residences will introduce about 100,000 square feet of space (indoor & outdoor), dedicated to your mind, body and soul, marrying modern technology with inner science and Eastern philosophies. On a pristine stretch of the Atlantic shoreline in Palm Beach County’s picturesque Singer Island, Amrit will offer each guest a “personalized roadmap” to wellness with the latest expertise, tools, techniques and 24/7 support to create a true wellness lifestyle and healthy habits. Amrit also offers a unique wellness platform for various practitioners to utilize its facilities, becoming a global source of collaboration for cutting edge wellness practices. Many will find their way to living better just by being here, because at Amrit balanced living is built into every moment. Vsit Amrit Ocean Resort & Residences at www.amritocean.com. Promoting wellbeing, Aromatherapy Associates is a British essential oil brand that uses its expertise to deliver award-winning luxury bath, body and skincare products. The founders, Geraldine and Sue, truly believed that an enriching aromatherapy experience nurtures the body and boosts the spirits. Building on their founders’ legacy, Aromatherapy Associates today focuses on Mindful Beauty by giving people time to stop and find balance in their lives. With its panel of six Wellbeing Experts, Aromatherapy Associates educates on the Art of Living Well and encourages people to have an all-round wellbeing approach to life. Visit Aromatherapy Associates at www.aromatherapyassociates.com. Booker is transforming the way local services are managed by businesses and discovered by consumers. Booker replaces everything from manual methods to disconnected software, and unifies the essential components of running a service business into a single web-based platform, accessible from any device. Booker also enables service business to sell their services online, through their website and a network of partner sites and apps, creating a seamless online booking experience for consumers. Booker processes over three million appointments each month across 75 countries. Headquartered in New York City, Booker’s customers include Fortune 500 companies as well as thousands of local service businesses. Visit Booker at www.booker.com. An award-winning provider of the most effective, professional skin care products in the natural and organic skin care industry, Éminence Organic Skin Care is sold in leading salons and spas in more than 40 countries around the world. Éminence melds herbal craftsmanship and innovation, skin rejuvenation techniques unique to Hungary and hand-picked fresh ingredients to craft premium natural, organic and Biodynamic® skin care that is good for the earth as well as good for the skin. Éminence displays its commitment to the environment by harnessing wind and solar power energy to produce products and geothermal heating in the laboratory, using only recyclable packaging with vegetable-based inks and committing to planting a tree for every product sold. Visit Éminence Organic Skin Care at www.eminenceorganics.com/us. Recognised as global leaders in spa, ESPA combines the conceptualisation and management of prestigious spas across five continents with the creation of pioneering, natural products rich in heritage, texture and aroma. ESPA is proud to partner with luxury hoteliers and property companies to create some of the world’s finest spas and equally proud to be a British company who manufacture their products in England. Highly efficacious and a pleasure to use, ESPA products are tested every day by a network of over 4,000 highly trained, professional therapists based in 60 countries. It is this combination of expertise and rich spa heritage that creates an award-winning and renowned brand. Visit ESPA at www.espa-consulting.com. Fairmont Hotels & Resorts connects guests to the very best of its destinations worldwide, providing travelers with memorable travel experiences, thoughtful and attentive service and luxury hotels that are truly unforgettable. Each Fairmont property reflects the locale’s energy, culture and history through locally inspired cuisine, spirited bars and distinctive decor. Combined with exceptional treatments, customized programming, healthy food & beverage offerings and innovative design, Fairmont also offers world-class spa and wellness services that contribute to an overall sense of well-being for travelers. With more than 70 hotels globally, and many more in development, the Fairmont collection boasts some of the most iconic and distinctive hotels in the world. Visit Fairmont Hotels & Resorts at www.fairmont.com. Established in 2013 and headquartered near Boston, iGetBetter, Inc., a mobile digital health & wellness company, develops and markets cloud-based software monitoring solutions designed to help hospitals and wellness institutions to engage patients &clients remotely in their rehabilitation and achievement of lifestyle goals. The mobile APP uploads biometric vital data e.g. body composition, weight, steps, activity minutes, calories burnt/consumed, sleep hours, heart rates etc. gathered by wearables devices onto the monitoring dashboard of the coach. Vital data of each client is displayed and analysed allowing the coach to follow up with the client based on real-time measurements. iGetBetter is a very effective tool to guide clients through their critical treatment phase after leaving wellness institution, building a strong and lasting relationship with coach and institution. Visit iGetBetter at www.igetbetter.com. Immunocologie is a skincare brand with its foundations rooted in one woman’s personal journey. Following a diagnosis of cancer, and with over 30 years of experience in the skincare industry, Karen Ballou understood that the skin is the first line of the body’s immunological defense – and wanted to create a skincare offering as luxurious as it is healthy, natural and effective. These principles are the basis of the Immunocologie brand, which is uniquely focused on the source of the skin’s performance and wellbeing: its immune health. Visit Immunocologie at www.immunocologie.com/. Lapinha is an integrative medicine and wellness center, located ¬¬in a farm surrounded by subtropical forests in Southern Brazil. The sight has 550 hectares, 165 of them are a permanent reserve, with ancient trees up to 1.200 years old, the organic farm, and the alkaline water (pH value of 8,3). A team of 160-member staff enables the guests to enjoy a fully holistic experience. Lapinha celebrates 45 years of expertise in health treatments based on the Sebastian Kneipp and Bircher-Berner philosophies in the beginning, and has continually expanded including Mayr Kur-Prevent Medicine and the evidence-based Natural Medicine. Lapinha’s medical concept is built on Trophology; Phytotherapy; Hydrotherapy; Physiotherapy, Movement Therapy, Biorhythm Therapy and Spirituality. Visit Lapinha at www.lapinha.com.br. The Matrixx Power Suit Company, LLC is focused on Health, Wellness, Fitness & Sports Training. The Matrixx Power Suit is a Revolutionary Patented Weighted Compression Training System with Resistance Technology which combines Strength, Speed and Endurance training into one by targeting three (3) core body systems simultaneously; Respiratory, Cardiovascular and Muscular. The unique design uses easily adjustable flexible rubber weights placed on various muscle groups to create different levels of resistance. The suit is easy to maintain and is machine washable. It can be used for Weight Loss, improving Balance, Stability & Circulation, as well as in the water for swimming and aquatic sports and training for Military & Astronauts. Visit Matrixx Power Suit at www.thematrixxpowersuit.com. Motivity Partnerships provides solutions for the 21st century workplace. Most companies keep employee resources and benefits in a silo. Motivity helps their clients take a whole company/whole person approach, creating a culture where the workforce is resilient and the company has a competitive edge. We start with an in-depth evaluation to understand your company’s unique culture, goals and resources. We then work with you to develop a strategy that integrates human resources, benefits, wellness, communications and leadership. We make sure there is an actionable and measurable implementation plan. Motivity can help your team create an engaged, thriving workforce. Visit Motivity Partnerships at www.motivitypartnerships.com. Jacqueline Piotaz Cosmetics AG is a Swiss family owned company. Jacqueline is the creator and founder of Timeless Swiss Skin Care, the unique Swissness pure innovative skincare brand is based on her 30 years of experience in the cosmetic world. Combining nature and advanced bio technology with the newest science and focusing on exclusive formulas, rare ingredients and an attention to detailed luxury. The brand provides a professional innovative treatment concept with signature treatments for top hotels, beauty day spas and luxury perfumeries. The company and products are based on the Swiss values of: Quality, Technology, Tradition and Reliability. Visit Jacqueline Piotaz Switzerland at www.jacquelinepiotaz.com. Rezilir Health is comprised of a team of world class board certified MD’s that deliver conventional and integrative medicine through a functional approach. We work with each patient providing customized care to uncover the root causes while creating practical approaches that address chronic illness and disease.Our practice is driven by doctors and nurses as lifestyle coaches who take the time to truly listen and connect with our patients, giving them hope and restoring their faith in healthcare. We actively partner with communities to develop healthy, sustainable pathways towards wellness and enduring results! We believe investing in your health gives you the greatest return…life! Visit Rezilir Health at www.rezilirhealth.com. Seabourn is the world’s finest ultra-luxury cruise line, earning numerous accolades since the company launched in 1987. With four all-suite vessels roaming the globe, Seabourn delivers extraordinary levels of personalized service, with nearly one staff member per guest; sumptuous accommodations in spacious suites; exceptional shore-side experiences in the world’s most desirable destinations, and award-winning cuisine. In 2016, Seabourn introduced a fleet-wide mindful living program offering guests a holistic spa and wellness experience in partnership with The Onboard Spa by Steiner. The new “Spa and Wellness with Dr. Andrew Weil” program is the first of its kind at sea. Visit Seabourn at www.seabourn.com. Serenbe is a leading wellness community focused on all aspects of a well-lived life. Featuring an organic farm, arts and cultural programing, multiple restaurants, boutiques and over 15 miles of nature trails, Serenbe is set within acres of preserved land. Where you can walk out your back door into nature and out your front door for a world-class meal; it’s the place you didn’t know you needed. The newest neighborhood will include a wellness center, destination spa and resort and housing for aging in place. Serenbe is a model for building community with nature in mind and wellbeing at its core. Visit Serenbe at www.serenbe.com. Six Senses resorts are discovered in some of the world’s most beautiful places. They are synonymous with a unique style – authentic, personal and sustainable, and in harmony with individual surroundings; local, yet in tune with the wider world. They are intimate, offering an emotionally intelligent approach to anticipative service, which supports delightful and unexpected surprises. Crafted guest experiences stimulate, energize and revitalize the human spirit.All aspects of Six Senses’ operations, including the Evason brand, embrace these values, which define the brand and the enduring Six Senses mission: To help people reconnect with themselves, others and the world around them. Visit Six Senses at www.sixsenses.com. The BodyHoliday in Saint Lucia is not only a great beach vacation but it has been famed for its unique approach to health and wellbeing. The experience is a combination of the very best of a vacation combining individual tailored classes in fitness, nutrition, lifestyle and overall wellness. It is designed to be the most relaxing, rejuvenating beach vacation in the world. The BodyHoliday makes a promise, “give us your body for a week and we’ll give you back your mind”. It offers a range of personalized treatment, therapies while taking advantage of the most comprehensive activity and exercise schedules. What makes it great is that you can do as much or as little as you like; enjoy an active fun filled vacation or choose to lie back and do nothing at all! Visit The Body Holiday at www.thebodyholiday.com. Marking 75 years last year, Two Bunch Palms has had much to celebrate. Since 2014, the iconic resort rebranded emphasizing its award winning healing waters recently voted the best in America. The multi-million dollar renovation included implementing sustainable design and practices throughout the resort, and promoting a culture of well-being. This recent incarnation along with its 3.5-acre solar farm put Two Bunch Palms on the destination spa map as the first “Sustainable Wellness Resort” in North America. Visit Two Bunch Palms at www.twobunchpalms.com. UL Environment empowers both manufacturers and purchasers to transform their sustainability efforts and environmental stewardship into true market leadership. Since its inception as a safety science company more than 100 years ago, UL is taking on new safety challenges such as helping manufacturers overcome the complex challenges of supply chain transparency, risks associated with chemical exposure and more. Every day, UL enables purchasers to make smarter, healthier and environmentally-preferable decisions. UL Environment provides a variety of services to help companies meet their sustainability goals, including multi-attribute sustainability certifications, including ECOLOGO Certification, GREENGUARD Certification to demonstrate that products are low-emitting, Environmental Claims Validations, product and chemical assessment tools, testing and Advisory Services. Visit UL Environment at industries.ul.com/environment.